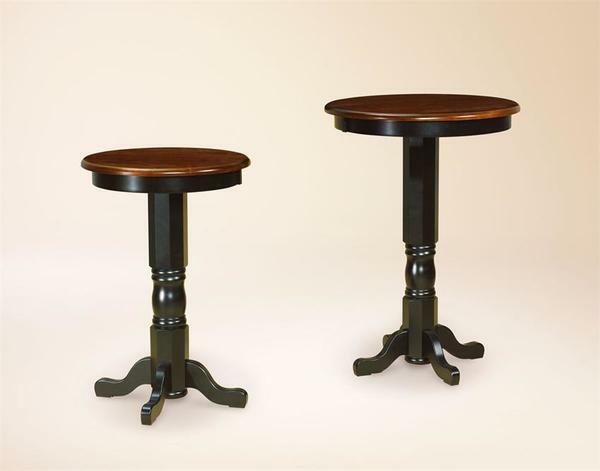 DutchCrafters Amish Bistro Table is perfect for home or commercial use. Over the years our dining room furniture and bar furniture has graced many restaurants, hotels and offices. Please call to speak to one of our Amish furniture specialists today with questions on volume purchase, custom requests or ordering assistance for this solid wood bistro table. They are happy to help in anyway that they can. Check out our Amish made stools to find the perfect matching bistro set. Show in Cherry Top with stain, Brown Maple Skirt & Base Painted.